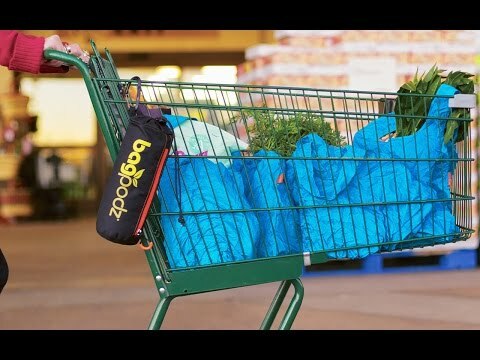 BagPodz is a reusable bag set that's sturdy and easily organized so you'll always have them on hand. The bags come neatly packed in a compact pod with a clip that you can attach to a shopping cart. At checkout, just unzip and pull out as many bags as you need. A second drawstring opening on the end lets you easily stuff them back into the pod. Each bag holds up to 50 lbs. 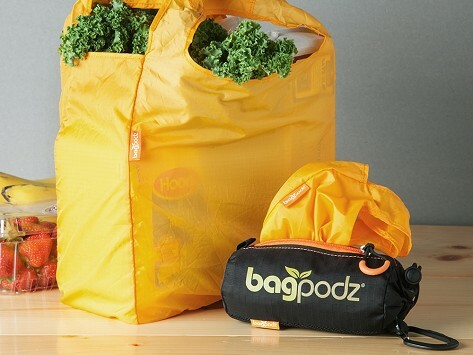 Dimensions: pod: 8" x 3" x 3"; each bag: 12.5" x 12.5" x 4.5"
BagPodz is a reusable bag set that stays neatly packed and on hand whenever you need them. The bags come stuffed in a compact pod that fits in the glove box or under a seat in your car. A clip on the pod lets you attach it right to your grocery cart. At checkout, just unzip and pull out as many bags as you need. A second drawstring opening on the end lets you easily stuff them back into the pod. The bags are the same size as a disposable plastic bag but can handle much more. A flat bottom helps things like beverage cartons stand up more securely. Go ahead and pack them really full; they’re made of strong, rip-stop nylon that can hold up to 50 lbs. Even better, they’re Bluesign® certified, meaning they’re low-impact, eco-friendly, and sustainably produced to stringent safety standards. Water-repellent and machine-washable, this reusable bag set is also great for traveling. Keep dry and wet clothing separate. Or bring a few bags along souvenir shopping. Any time you want to use (and reuse) these bags, they’re organized and ready to go.